The moment police captain Colin McAllister sees her on TV he knows. She may call herself Nell Smith, but she is Maddie Dubeau—the girl who went missing from Angel Butte, Oregon, years ago. She's haunted Colin, and now the adult version of her is so captivating, he can't stay away. He wants to help her recover her memories—even solve her case—without crossing a professional line. But distance becomes impossible when the threats against her escalate. It's clear someone is determined that Nell never remembers what happened to Maddie. Colin must keep her safe so that he can finally bring her home…to his home. "Some bones have turned up." Police Captain Colin McAllister lifted his head. "Bones?" He'd waved Duane into his office a minute before. Lieutenant Duane Brewer headed Criminal Investigations, which meant that when he wanted a word, it was more likely to be about a corpse than a shoplifter. Still, it had taken Colin a moment to tear his attention from his computer monitor. He'd been trying to figure out how to plug holes in manpower without leapfrogging academy grads, with their shiny new badges, to detective. The problem was becoming chronic, and he knew who to blame. 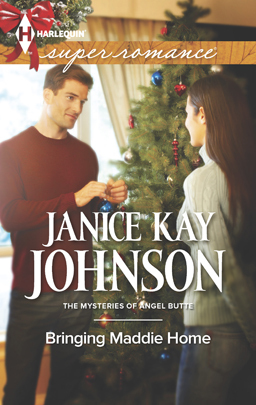 He'd known for ten years where the cancer lurked that was sickening the Angel Butte Police Department. He was just too damned stubborn to jump ship the way the others had. He saved the work on his computer and leaned back in his leather desk chair, studying the man who'd been his mentor and whom he now outranked. Fifty-four years old and thickening around the waist, Duane was the quintessential detective: patient, thorough and dogged. A loner, he liked what he did and hadn't been happy about the promotion to lieutenant. Colin had begged him to take it. "You know those trees they've been taking out in the river park?" Already feeling apprehension, Colin nodded. The infestation of pine beetles had become obvious when needles turned brown and fell. Some fungus had swept along in the wake of the beetles, taking advantage of the weakened trees. The city parks department had made the decision to cut out the infested ones before they fell in the next windstorm. "They're digging out the stumps, where they can get a bulldozer in." "Pulled one out today and some human bones came with it." "No. The foreman's pretty shaken up. Hasn't found a skull yet, but there's a lower jaw. The teeth have fillings in them." Duane ran a hand through his thinning hair, looking shaken. "Colin, I haven't been out there yet, but it sounds like this isn't more than a couple hundred yards from where Maddie was grabbed." Maddie Dubeau was Duane's niece. Frantic at her disappearance twelve years ago, Duane had insisted on taking over the investigation, and nobody had been able to deny him. He'd let Colin, then a young officer who had been first responder, stay involved, going door-to-door with questions and searching the grid. They hadn't talked about the case in years, but Colin knew that Duane had to be even more haunted by their failure to find her than Colin had been. His own gaze shifted to a bulletin board where he kept a few photos. Victims whose killers had never been found. A two-year-old beaten to death by her father despite multiple calls to 911 from concerned neighbors, babysitters and medical personnel. Two kids who'd disappeared and never been found. Faces he wouldn't—couldn't—forget. Some were personal failures, some were department. He wanted their eyes watching him, even if he didn't often look back at them. Madeline Noelle Dubeau's picture was one of them. It was her last school photo, taken her freshman year of high school. This was more flattering than the one on the learner's permit he'd found at the scene but had bothered Colin in the same way. In it, she was smiling politely, as though the photographer had insisted, but her wide, cautious eyes weren't happy. Looking at it, he thought that this was a girl who always stayed a step back, who didn't expect the best from anyone. Just shy, he'd told himself every time he tried to delve into her secrets, but he couldn't make himself believe it. He'd never asked Duane, who didn't like talking about her. Duane rose and went to the bulletin board, standing with his back to Colin's desk. His shoulders hunched under his jacket. "I don't keep a picture of her out. I can't stand to." "Sometimes I'm convinced if I look long enough, I'll be able to tell what she was thinking." Impatient with himself, Colin grabbed his weapon from the top drawer and stood, then snagged his suit jacket from the back of the chair. "I'll drive myself, but I want to see the site." "You won't have any trouble finding us." After taking one last, long look at the photo of Maddie, Duane flipped a hand and walked out. Colin followed, pausing only to let his assistant know where he was going. Not until he was behind the wheel of his SUV did he think back to that night. He hadn't been two months on the job when he'd been sent to the park to investigate an elderly neighbor's report that she'd heard a woman's scream. Teenagers liked the park at night; even in his short time patrolling, Colin had already broken up keggers half a dozen times there. The park, a sizable one, was within city limits, and a stretch along the bank of the Deschutes River was manicured and included a picnic area and playground. Ten or fifteen acres had been left in wilderness, only a couple of dirt paths showing that kids cut from one neighborhood to another through the swath of forest. That night, though, he hadn't been able to feel the presence of anyone at all. Kids weren't good at being absolutely quiet. They were prone to giggles or nervous rustling or shushing each other. And he hadn't known why, but the fine hairs at his nape stirred from the moment he stepped into the darkness, swinging his flashlight beam in an arc to pierce the darker shadows beneath madrona and snowberry. Sitting here now, in the parking lot outside the police station, he let himself remember how it had been. The moment the yellow beam caught a glint of metal. He'd been maybe twenty-five yards into the woods when he saw it. A good ten feet off the trail a bike lay on its side. He'd stepped close, squatted on his haunches to look closely and felt a chill. No, the mountain bike wasn't just lying there, as if temporarily flung aside. One handlebar dug deep in the rusty-red soil and left a track two feet long. Maybe his imagination was excited by the deep night here under the ponderosa and lodgepole pines, by the eerie quiet, by the dispatcher's description of the shrill scream cut off sharply. But Colin couldn't help picturing the bike rider hanging on tight, trying to use the bike as an anchor, while someone wrenched him—no, her, if the neighbor had been right—off of it. The front tire rim was bent, the spokes mangled. He thought someone might have stepped right there, the way you might plant a foot on a pet carrier to yank a reluctant animal out. Rising to his feet, he swept the flashlight beam in a careful pattern. Footprints wouldn't show up well with the ground so dry, but he could make out scuffed vegetation. Closer to the path, furrows and imprints marked the soil. And a dark patch. He edged nearer, still trying to keep his distance. If this was a crime scene, he didn't want to taint it and be given hell by the detectives. Something had been spilled there, and was still wet. Colin had stretched out to his full reach and touched the edge of the spill, then brought his finger to his nose and sniffed. The acrid scent was unmistakable. Blood. A fair pool of it had been lost here. Not enough to suggest someone had bled out, but too much for an innocent accident, even a head wound. He had just made the decision to go back and call this in when he spotted something else, almost hidden beneath a ceanothus. A wallet. .no, a coin purse. Leather, in the shape of a cat's face, whiskers, nose and eyes burned into the hide and colored. Cute. He tucked the flashlight beneath his arm, put on a pair of latex gloves and picked up the coin purse. Change rattled as he unzipped it and found folded bills in there, too, and a driver's license. No, he saw, his stomach clenching: a driver's permit, the kind issued to young teens. He found himself staring at the photo. A girl's face, young but somehow not hopeful. She was shy, probably, gazing warily at the camera. A few freckles scattered across a small nose. Instead of being youthfully soft, this face was thin, the wings of cheekbone too prominent, the chin too pointed, the forehead too high. Hair was scraped back into a ponytail. In this light he couldn't tell what color her eyes were. Brown, said the description. Hair brown, too. Her name was Madeline Noelle Dubeau. He remembered feeling stunned. He knew that name. Marc Dubeau was a prominent local businessman, a friend of the police chief's. That last name wouldn't be common in central Oregon. This almost had to be his daughter. Madeline, he noted, was fifteen years old, turning sixteen on November 26, when she would be eligible to take the driver's test for her license. She was the same age as Colin's sister, Caitlin. He turned the flashlight beam again on that dark patch where blood sank into the soil. Anger and a sick feeling squeezed his chest. Would Madeline Dubeau ever have a chance to get that driver's license? Colin had tried to convince himself he was letting his imagination run away from him, that she'd had a friend with her who had already helped her make her way home. Or driven her to the emergency room. But, however green behind the ears he'd been, he knew better. The prickles on the back of his neck said otherwise. Something bad had happened to this girl. Now in the SUV he grunted, still staring ahead unseeing through the windshield, and remembered the chill when he found out her maternal uncle was a cop, a detective. The department had thrown everything they had at the case, but in twelve years, they had never found a trace of Maddie Dubeau. Unless, today, it was her bones that were wrenched from the earth along with the tree roots.